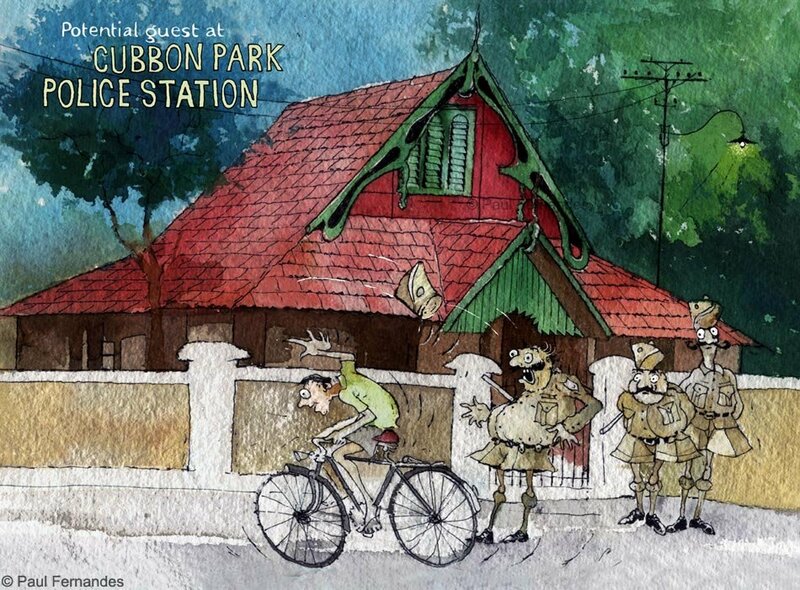 Take a walk by Richards Park in Bangalore, and you’ll stumble upon a most curious gallery that will lure you inside with its funny sketches of a man on a wobbly bicycle and a policeman with ballooning shorts. I followed my feet to find inside a treasure-trove of the city’s collective memories. 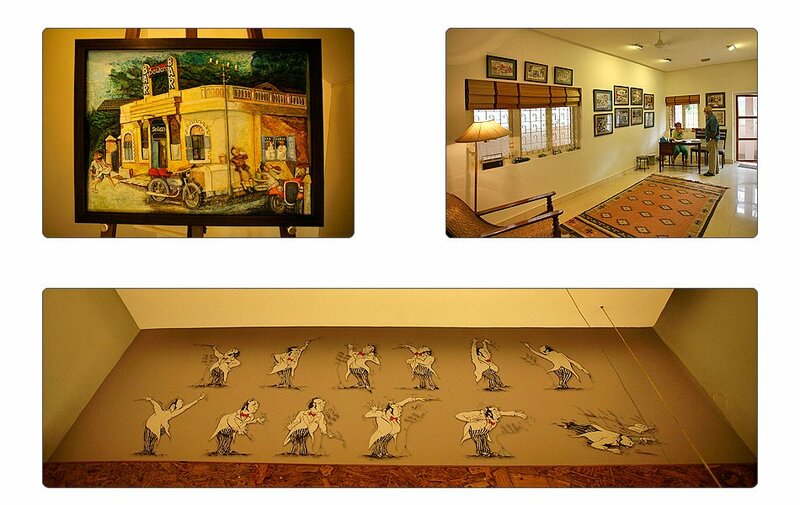 Apaulogy, the gallery, is a showcase of artist Paul Fernandes’ work as he recaptures the Bangalore of ‘60s and ‘70s – when it was still a sleepy little town. 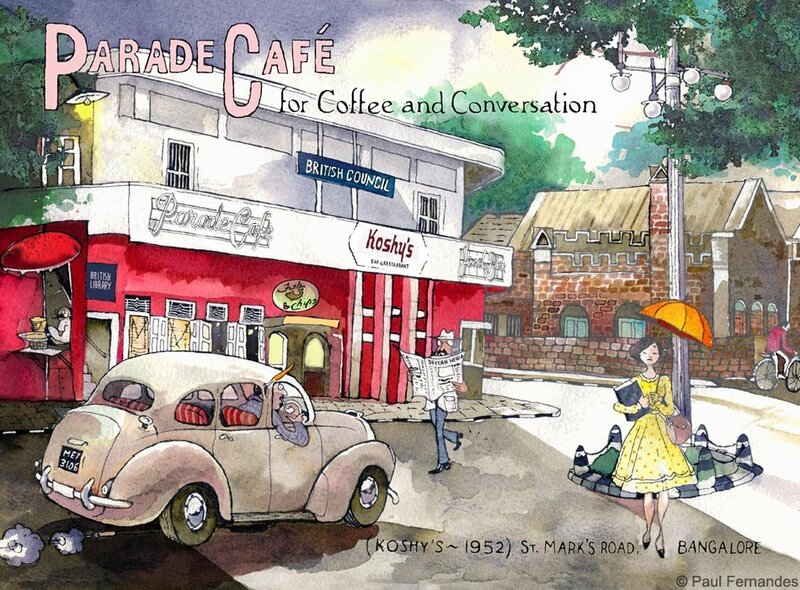 What makes it absolutely delightful is that Paul’s illustrations of the city’s history are in the form of cartoons. 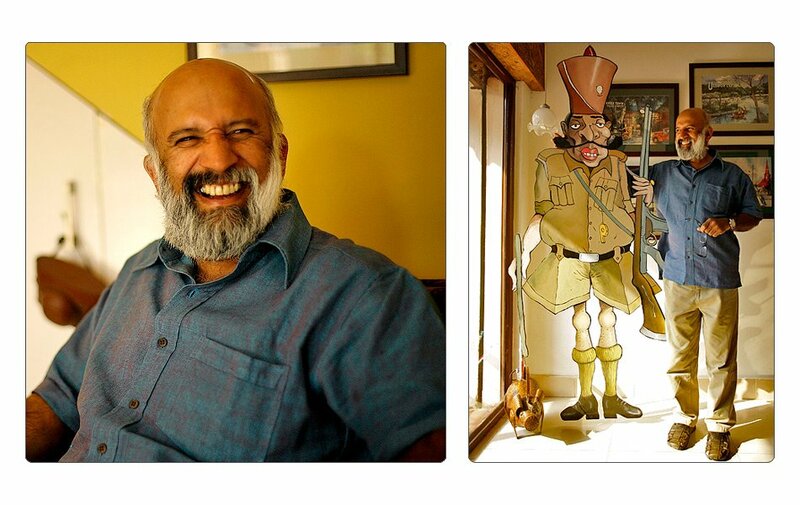 Artist Paul Fernandes with a cut-out of a policeman from the 1960’s. The official police uniform included shorts starched so stiff they were nicknamed parachutes, and a well-oiled moustache on a Rs. 5 maintenance-allowance. 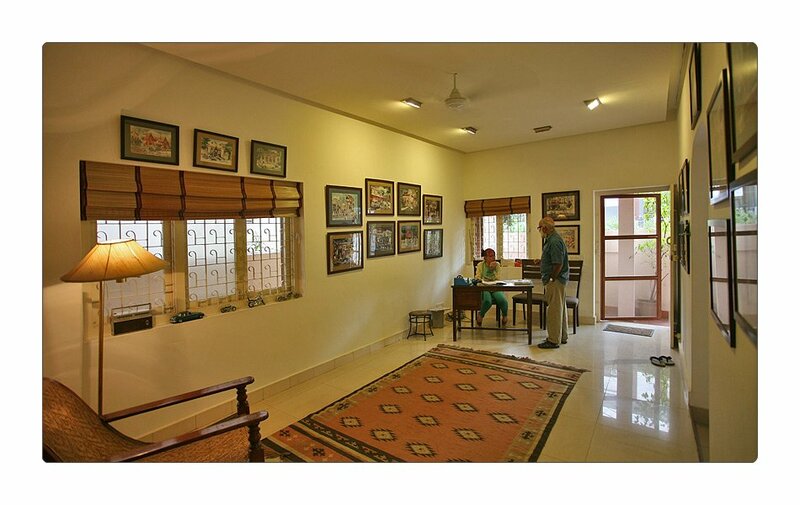 Paul Fernandes with Jatin Prabhu and Mona Weber, the gallery’s charming curators who will take you through the time-machine of Paul’s sketches, back to a more comic and peaceful Bangalore. 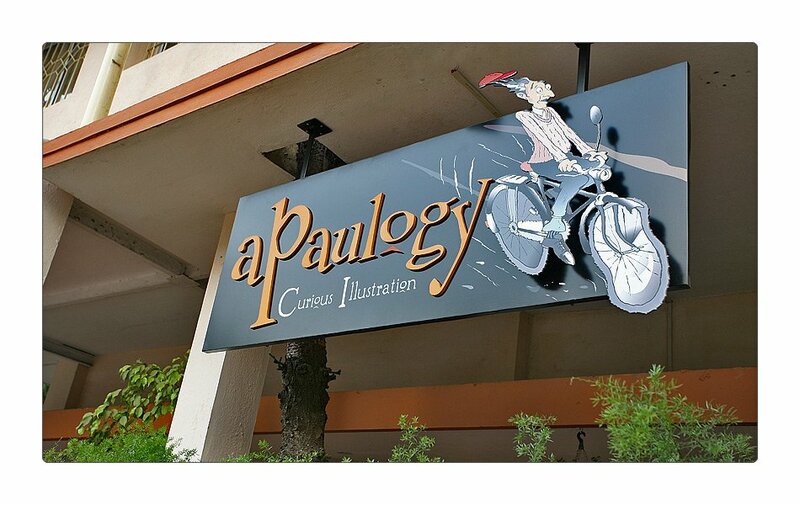 Walk through the warm spaces of Apaulogy, step into a picture and travel back in time. 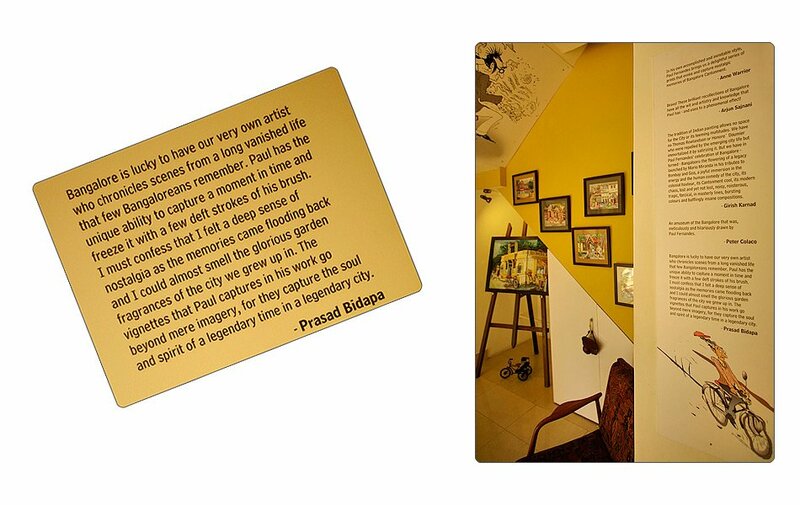 If you’re lucky you’ll even bump into the artist on many of his (mis)adventures! 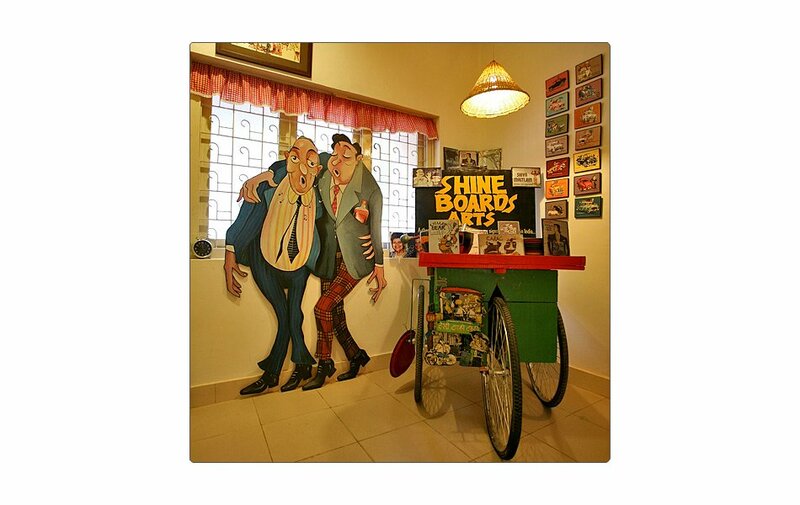 The hilarious Shine Boards – a collection of misspelt sign-boards across the country that will leave you in splits. 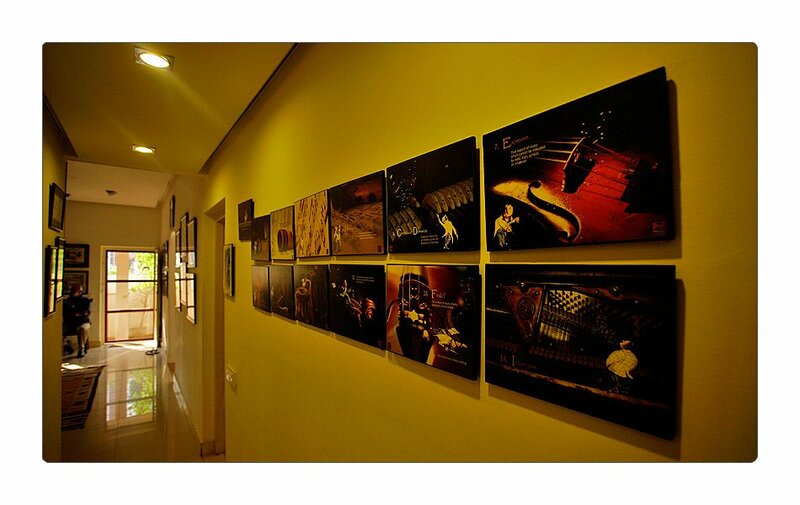 Paul’s gallery Apaulogy is located near Richards Park, in Bangalore. 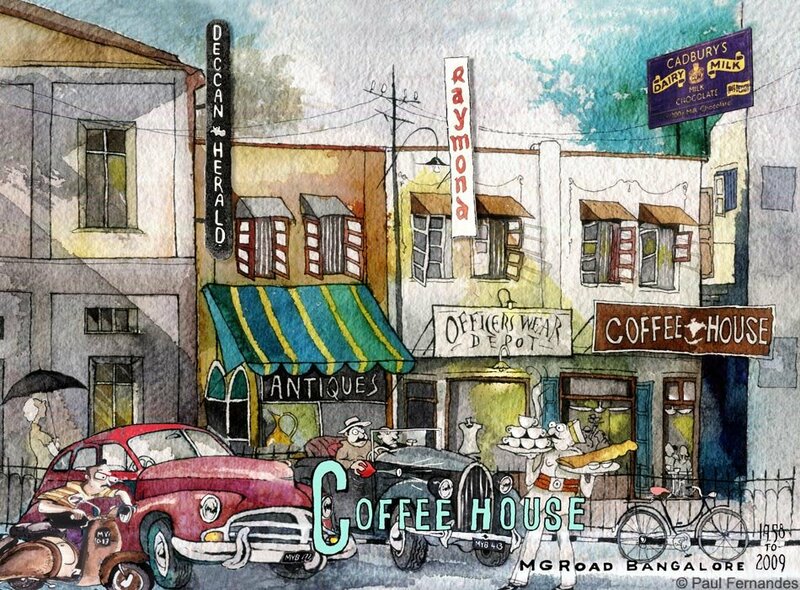 India Coffee House, MG Road, where the coffee cups were always full and the conversation never ran out. 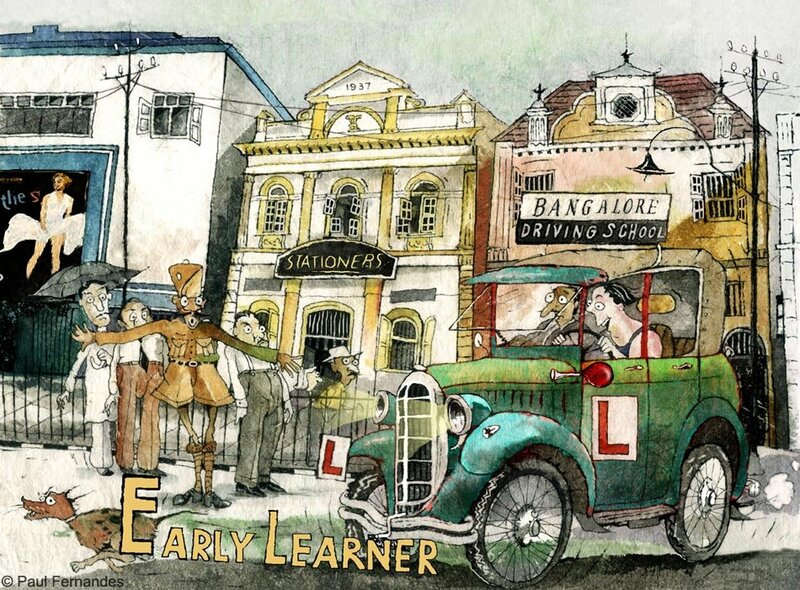 Pedestrians at the risk of early learners at the Bangalore Driving School. Koshy’s, an old favourite, hasn’t changed much. Unfazed by posh neighbours like the Hard Rock café, it is abuzz with endless energy fuelled cups of tea and homemade sandwiches. A boisterous Mangalorean wedding: food, high spirits, and a veritable jewel-box of characters that belong to every Indian family. 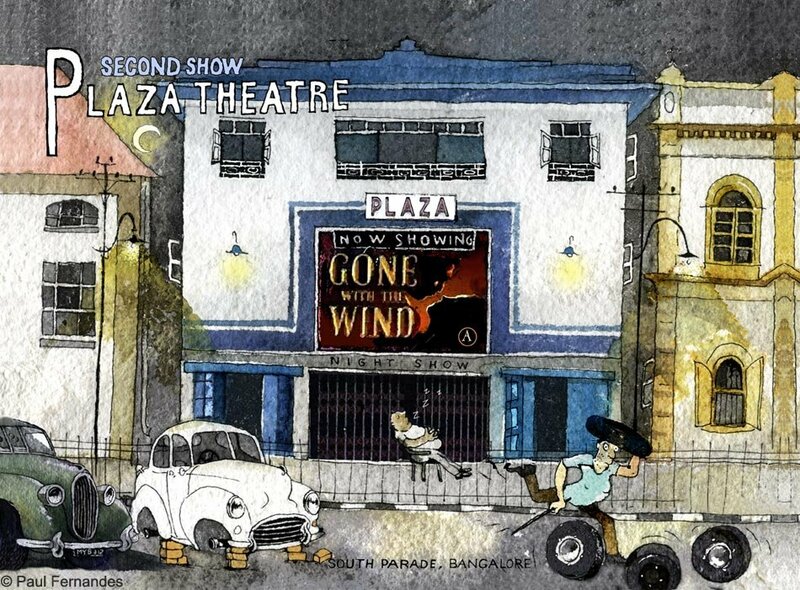 Plaza theatre that once screened the latest films in Bangalore is now the entrance to Namma Metro. In simpler times, when crimes were more innocent. 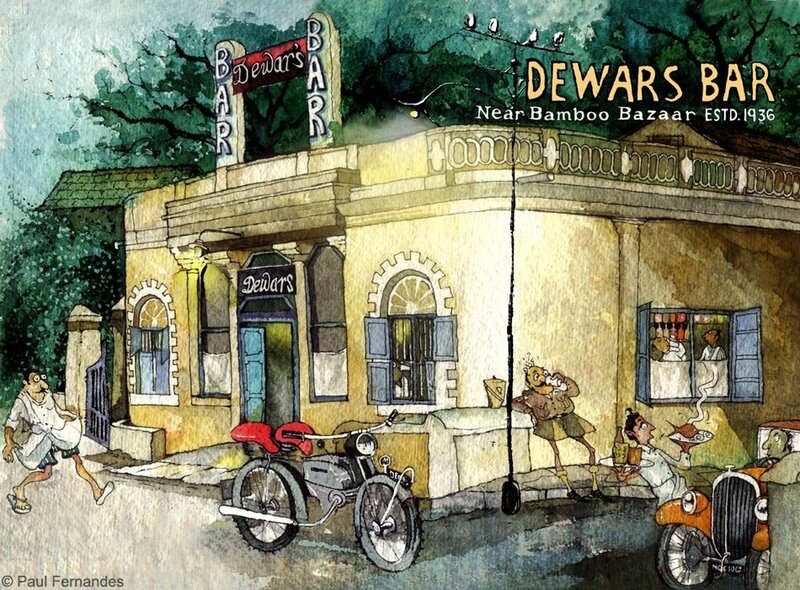 In Pub City, Bangalore, Dewars Bar was the most popular watering hole. The name of the bar is apparently a play on Devarajan, the owner of the bar and Dewar’s whiskey. 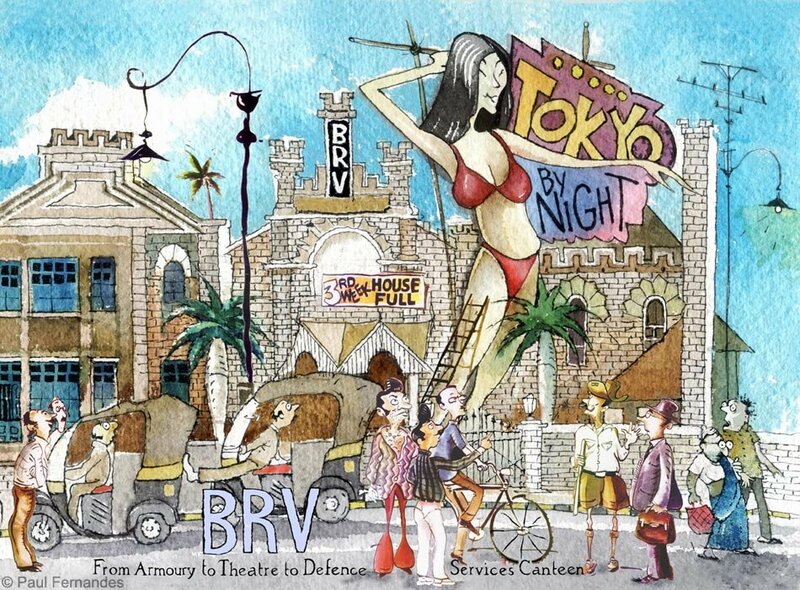 The BRV went from British armoury to premier movie hall that screened all the James Bond films. However, when they began to lose their audience to competition from other theatres, they began to screen racier films, with women doing cabarets. In ’77 a 20 ft. cut-out of a Japanese woman in a bikini took the city by surprise. But despite the collective shock at such a brazen image, Bangaloreans of the time were too laid-back to organize a hartal or protest. 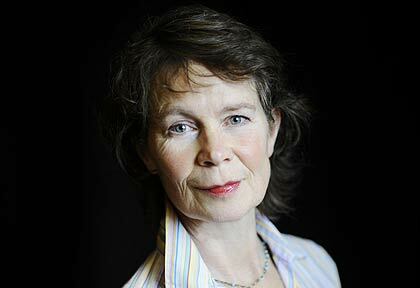 Actress Celia Imrie ( Bridget Jones’s Diary, Star Wars: Episode I, Nanny McPhee) recently wrote an article for the Daily Mail discussing her nightmare at the hands of a MK-Ultra psychologist. Living as an actor is rather like living life on the trapezes in a circus. Every time you jump on, you have to pray that when the time comes for you to jump off there is another trapeze swinging your way. I have been very lucky. So far they have kept swinging by and over the years I have had more than my fair share of roles on stage and television, including Upstairs Downstairs, The Darling Buds Of May, Dinnerladies, Acorn Antiques and Cranford. Then there are the films, parts that have, to my surprise, given me quite a saucy reputation. After Calendar Girls, people might well think of me as something of an exhibitionist. I am not. In fact, the scene where we had to take off our clothes was a source of great concern. It was shot one actress at a time – and it was my bad luck to be called ahead of Helen Mirren, Julie Waltersand the rest of that wonderful cast. I arrived at the studio feeling quite ill. It was as though I was in some horrible dream, wading through treacle. With a thundering heart, clutching my dressing gown around me, I made my way down to the set. Even I couldn’t put it off for ever. I tried to imagine that somehow I wasn’t really taking my clothes off and that, anyway, no one would ever see the film. How wrong I was, even if some strategically placed cupcakes preserved my modesty. There was nothing understated about my part in Nanny McPhee either. Before it was released, the film was shown to a sample audience of children and they were terrified by the sight of my non-surgically enhanced bosoms. The studio decided that there was nothing else for it but to airbrush out a large percentage of my cleavage – a move that cost the production company £150,000. It is hard to believe, then, that as a child I dreamed of being a sylph-like dancer. While other girls swooned over The Beatles and the Rolling Stones, I worshipped Rudolf Nureyev and Isadora Duncan. It was a yearning that was to lead me almost to the grave before I was 15 – not that I had any idea at the time. I pored over ballet books and magazines, and practised whenever I could. I was going to be a dancer. My mother Diana was a trueblue aristocrat, descended from William the Conqueror and listed in Burke’s Peerage. My father David, from a poor Scottish family, was a doctor. I pressed them to let me attend ballet classes, to which they agreed. Always stubborn and wilful, I had my career planned. I would go to White Lodge, the junior branch of the Royal Ballet School in Richmond, South-West London, and serve my time in the chorus before being discovered, finally dancing in the arms of Nureyev, who would worship and probably marry me. I practised and went in for every exam, bounding through the grades until I was good enough for my teachers to send me, aged 11, to audition for a place at the Royal Ballet School. Waiting anxiously at home for the results to arrive, I yearned for the day when I would be whisked away from our home in Surrey to start my new life as a ballet student. One week. Two weeks. A month. But the letter never came. I knew something was wrong, so went searching for it, breaking into my mother’s bureau. There it was. Too big? I was shattered. Surely this could not possibly be true? All right, so I might be too large at this moment, but I had seen diet adverts in newspapers. Surely if I worked hard enough at not eating, I would get small enough for the whole judging panel at the Royal Ballet School to get fat themselves – eating their words. Over 18 months I lost an astonishing amount of weight. It was noticed first at six months by our nanny, known as Pop, when we had to try on summer clothes for our annual family holiday near Bognor Regis, West Sussex. After that I realised I was being watched at mealtimes. I would look at myself in the mirror and, even though I was something near a skeleton, I didn’t think I had gone far enough. In despair and I am sure with some embarrassment – my father being an eminent doctor – my parents brought in a child psychologist. I was 5ft 2in and weighed 4st. What was the problem? Why couldn’t they make me eat? 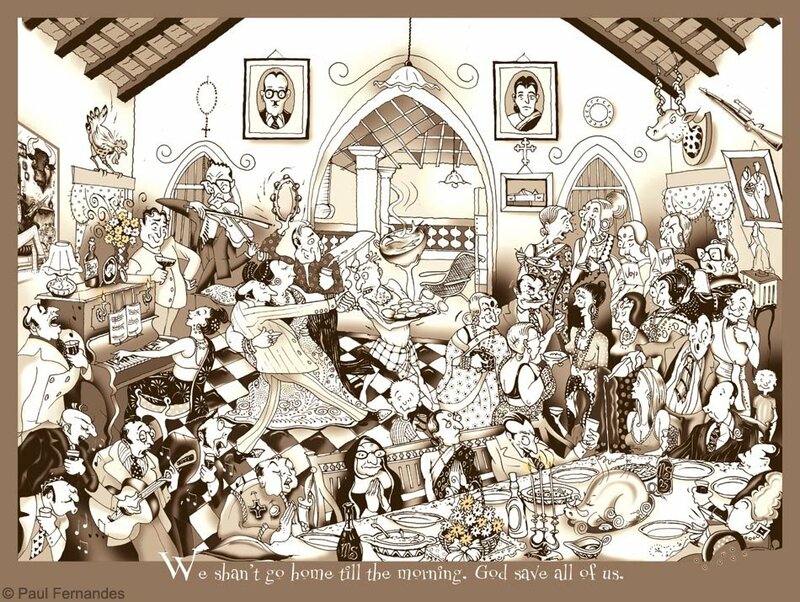 In those days there was not the excess of food there is now. People ate three pretty meagre meals a day if they were lucky, with no snacking in between. Many people in those days were malnourished, but not through personal choice. So it was a mystery to the experts to find someone who had decided not to eat, just as it might have been then to find someone who was obese. I was sent for a brief spell in the local hospital, where, bewildered by a condition they had not seen before, staff simply offered me three meals a day, which I politely refused. After a few weeks, I was released to spend Christmas with my family. I was happy to come home, but, far from being cured, I now knew that in future I must find even better ways of avoiding eating. I became sly. I worked out every way to dispose of food. I was so successful at it that soon I was little more than a carcass with skin. Desperate now, my parents decided to send me away to St Thomas’ Hospital in London, to enter one of the special wards belonging to the Department of Psychological Medicine. And once there I was placed under the care of world-famous psychiatrist William Sargant. I was 14. Now, more than 20 years after his death, Sargant is notorious for his work for MI5 and the CIA, particularly its covert MK-ULTRA mind control programme. Even then, Sargant was a world expert on brainwashing. Today his books are said to be studied by Al Qaeda. His work has links to the mysterious death of CIA biochemist Frank Olson after being given LSD; the Jonestown massacre in Guyana, where 900 people killed themselves; and to the mind-bending and occasionally lethal drug experiments performed on unwitting human guinea pigs at the Porton Down research centre in Wiltshire. 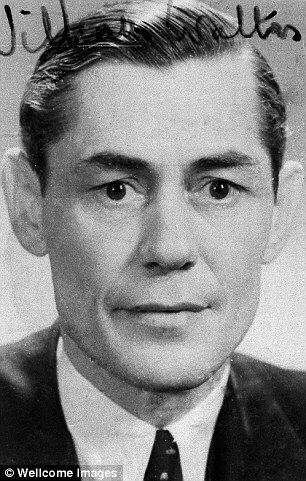 Sargant’s methods were simple: electric-shock treatment and insulin-induced comas leading to continuous narcosis, or deep-sleep therapy, complete with taperecorded ‘brainwashing’ orders being played at the patients from beneath their pillows. And to think that all this came free on the NHS! The hospital building is still there and even today it sends a chill through me when I pass it on my way to Waterloo station, the Imax cinema or the National Theatre. It is a gloomy, dark red-brick edifice, the green and white ceramic tile lettering still declaring it to be the Royal Waterloo Hospital for Children and Women, although today it houses the Schiller International University, a private American college. From outside the Imax, you can see the window where I would sit waiting for my mother to emerge from Waterloo station, hurrying across the road, looking frantic. She was the only one who came to see me and I often wonder whether anyone else in the family even knew about her rushed, desperate visits. 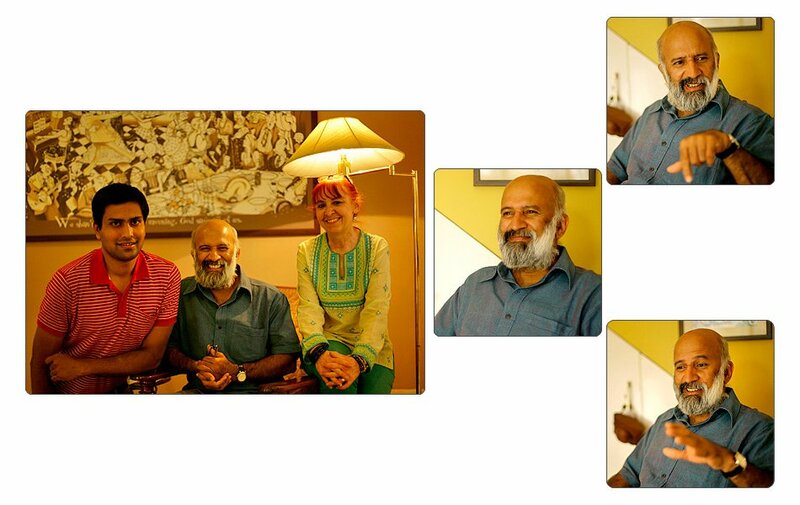 After all, I was the black sheep of the family. The doctors and nurses did their daily rounds. Twice a week or so, we were treated to a bedside visit from the Great Man himself. Sargant still features in my nightmares. He was brusque and cold, and he never talked directly to you. Instead he issued orders over your head, talking about ‘this one’ and ‘that one’. But that was preferable to making eye contact with this proud, incorrigible man with his dark, hard, evil eyes. I have only seen eyes like that on a couple of other people in my life. After Sargant left the ward, the nurses would start preparing the horrors he had prescribed for the day – the electro-convulsive therapy. Friends have asked what it was like to have electrodes put either side of your skull before huge surges of power were fired through your brain, while you squirmed and wrestled and shrieked and moaned and dribbled into the pillow. But the truth is I don’t remember. I do, however, remember vividly watching the woman in the next bed when it was her turn to be assaulted in the name of health. I remember every sight, sound and smell. The huge rubber plug jammed between her teeth; the strange almost silent cry, like a sigh of pain; the shuddering contortions and jerky gyrations of the tormented body; the scent of burning hair and flesh. I remember also the famous Narcosis Room, a ward where patients were forced into a drug-induced sleep for days while tapes played instructions to them from under the pillow. Whenever I have been asked about Sargant’s Narcosis Room, I can describe it perfectly. I used to sneak out of the ward to peer through the portholes in the swing doors, and gaze at dead-looking women lying on the floor on grey mattresses, silent in a kind of electrically induced twilight. When people ask if ever I spent any time inside, I used to reply ‘No’, for I do not remember that ever happening. But it recently occurred to me that everyone, in order to be put into the Narcosis Room, would first be drugged and that although I saw many women come back to the ward from there, I never saw any patient emerge from the place awake. You went in asleep and you came out asleep. I don’t think anyone who was treated by Sargant’s sleep therapy was at any time aware of going in or coming out of that room. While inside, you were totally unconscious. So maybe I was in the Narcosis Room. I could not possibly know. It is probable, I realise now, that I did go in. Like the electric shocks, I presume it definitely happened to me, though I can only recall it happening to others. I was certainly injected with huge doses of insulin. These injections are now understood to be one of the methods Sargant used to kick-start his sleeptherapy process. I cannot know whether his mindcontrol methods worked on me as I do not know what the tape recordings under my pillow were telling me to do. Some years back, I tried to find my hospital records, to see whether I could find out the limits of my treatment and if I had been in the Narcosis Room. I wanted to know the exact instructions on the tape constantly playing under my pillow, Sargant’s wishes drummed relentlessly into my young, unconscious brain. Unfortunately, my search was in vain. When Sargant left St Thomas’, he illegally took away all his patients’ records. By the time of his death in 1988, every single piece of paperwork about his inhumane treatment of us, the human guinea pigs, had been destroyed. So I will never know the absolute truth. I do recall being given massive doses, three tumblers a day, of Largactil, an anti-psychotic drug. The effect of this drug was startling. My hands shook uncontrollably for most of the day and I’d wake up to find clumps of my hair on the pillow. But the worst consequence was that everything I saw was multiplied by four. When Sargant came into the room, I saw four of him. It was horrific and terrifying. Even simple tasks such as picking up a glass of water became impossible. The drugs had turned me into a victim. As she increased the dosage one day, I overheard one nurse saying to her senior that I was exhibiting a ‘dangerous resistance’ to the drugs. Dangerous for whom, I wonder? Who could tell in that terrible place where, as far as I can see, the truly insane were the workers rather than the patients. Sargant used to say that every dog has his breaking point – the eccentrics just took longer. I suppose my ‘dangerous resistance’ was what he was talking about. I like to think that I was one of those eccentric dogs he did not manage to break. Many years later, I went with friends to see a film called Coma. It was a secondrate thriller starring Michael Douglas and Genevieve Bujold, in which Bujold discovers a ward full of patients suspended in hammocks in druginduced comas. When we came out into Leicester Square in London, my friends were laughing at the silliness of the plot, but I had the shakes and it took me some days to recover. They probably thought I was coming down with something. In fact it wasn’t until years later that I saw the link and realised why that film had upset me so deeply. Whatever Sargant might have thought, my eventual cure was nothing to do with him or his bizarre techniques. The events that saved me from my self-induced anorexia came about in a very simple way. Two things happened in short succession. First, one of the nurses, quite improperly I am sure, said to me one morning: ‘You do realise that your selfish act of starving yourself means you are stealing the bed of a truly sick, possibly dying child?’ She described other stricken children she had treated – those with polio and cancer. She had no idea but what she said was more powerful than any of Sargant’s insulin injections and taperecordings. My conscience was well and truly pricked. A few days later, my dance teacher came to visit me. I didn’t know the true reason at first but when I did, it was to send a chill through my barely there flesh. Miss Hawkesworth had been told that medical opinion was agreed that my weight was way below that which could possibly sustain life for any length of time. I would not survive the few weeks until Christmas. I had spent three years with everybody telling me: ‘You must eat. You will eat. If you don’t eat you will fade away. Please eat. Eat. Eat. Eat.’ And so I didn’t. Now here was a new order – ‘You will die!’ Die? How dare anyone tell me what to do. I wasn’t going to die just to please them. Whenever I am issued with an absolute order, my instinct has always been the same: do the opposite. And thanks to Miss Hawkesworth, I decided there and then I would not oblige these horrible, self-appointed gods of psychiatry and die just to satisfy their theories. Slowly, I started to eat. I reversed the action that had been my secret weapon against them, and in twisting it round, it became my new secret weapon against them. I decided I would show them that they knew nothing about me. Plus, I was not going to let anyone think that my selfishness was responsible for depriving a sick child of treatment. I later returned to school, somewhat changed in appearance. During a consultation with my psychiatrist, I had said I would like to have a baby one day, and hoped that would still be possible since I had upset the usual order of puberty. Specialists at St Thomas’ decided to give me a massive dose of oestrogen to kickstart the process. The trouble was that practically overnight it sent me from being flatchested to a 38in doubleD cup. So, resembling a teenage brunette version of Jayne Mansfield in a fright wig, I took my O-levels and got the same number as Princess Diana (you can look it up if you’re so interested). I left school the day I turned 16, the earliest day I legally could. Determined to follow a life on stage, preferably with some dance connection, I applied for and won a place at the local drama school. I was on my way. Years later I was talking to actor Nicholas Lyndhurst’s wife Lucy. She had trained and become a professional dancer, even appearing with the Royal Ballet. She described the strife and tension, the painful muscles, bleeding toes, rivalry and starvation diets. For the first time in my life I wondered if I had been fortunate by being forced out of dance and into acting. I felt a tremendous surge of relief. I started to wonder what had impelled me to chase a desire that had almost killed me at 14. Now, I finally knew that my life had gone the right way. I had taken the best possible path.